Will Bullas’ enormously popular Food and Wine series is a playful tribute to the world of fine food and wine and the characters that inhabit it. He won Best of Show in 2007 from the Taster’s Guild International Label Competition for his painting the wine king¯yes, a lion, in a tux, with a glass of cabernet!¯used on Chateau Lafayette Reneau’s Roaring Red wine label. He has won the Past President’s Medal for distinguished work in watercolor from the American Watercolor Society, as well as their Mario Cooper/Dale Meyers Medal. …toast of the Rhine joins Will’s previous Fine Art Editions on the subject, white wine and tails and Crabernet. Although most of Germany’s vineyards owe their existence to the Rhine River, the area is not so well known for its wildlife. 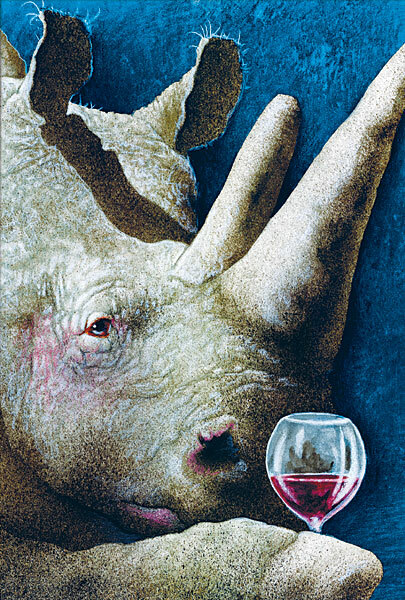 The solemnity of the rhino may remind you of a stuffy sommelier but the blush in his cheek betrays this wine aficionado’s essential modesty. toast of the Rhine… will make a delightful addition to your wine cellar, kitchen or office.